This season, just look towards your grandmother or rather your grandmother's home decor for style inspiration. Styles that incorporate needlepoint or tapestry into the design are the latest craze this fall. Sadly, I have none of this trend in my wardrobe. Boo! However, this trend would be relatively easy to DIY. All you would have to do is thrift a piece of fabric with needlepoint on it (perhaps a pillow with needlepoint stitched onto the front? Then you could just cut that out and use it) and sew it onto whatever! I am actually thinking of doing that myself. Would anyone like a DIY tutorial? If you don't feel like getting crafty, check out this Nasty Gal tapestry backpack, these Jeffrey Campbells, or this floral tapestry dress. So are any of you planning on trying the needlepoint/tapestry trend out this fall? Hello! This is what I wore today for one of my last days of summer ( I start school next week). I chose to style my outfit around my lace Oasap dress. To keep the look summer appropriate, I added some yummy, mint-colored socks and a daisy crown. I polished the look off with tan flatforms, a tan bag and a handful of rings. I love the slightly ethereal, almost fairy tale like vibe produced. And since it is almost fall, I have been wearing my flower crowns nonstop! They can still be worn in the fall on the occasional warm day but I have a feeling that once fall begins, my obsession with flower crowns will start to end. On another non-fashion related note, I have fee night tomorrow night at my high school. Basically, a few fees (laptops fees, fees for certain classes, etc. )have to be paid, I have to request a locker, receive my schedule for the upcoming year and make sure to purchase a parking pass. As dull as it may sound, I am actually relatively excited as it marks the beginning of my senior year! I hope that you all are enjoying your last few days of summer! One of the major trends this fall is the preppy/ equestrian/ school girl style. 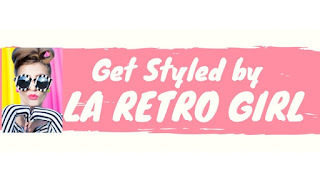 Designers looked into the past and revived these classic styles. They played around with preppy blazers, riding boots, plaid prints, the newsboy hat, collegiate sweaters, classic coats, the color maroon, letterman jackets/sweaters and wool scarfs. They grabbed inspiration from Tommy Hilfiger (the king of classic, preppy styles), The Love Story, Ivy League schools (Harvard, Yale, etc.) and private school uniforms. Try this trend out for a quiet day spent studying at the library or reading your favorite book. One of the things that I love about this trend is its wear-ability. Usually, looks that are seen on the runway have to be heavily modified before the general public tries the look out. But not this look. Anyone can rock a plaid skirt or plaid pants, a classic blazer and a little bit of maroon. This is probably one of the trends that I am most excited for this fall. Letterman sweaters, wool shorts, plaid prints, preppy belts, and maroon here I come! Hello! This is what I had to tell you guys about: my first car! Although I've had my license for a little over two months now, I haven't driven very much because I haven't had a car to drive. Since I would like to drive to school this year and plan on getting a job, I decided that it would be good (and not to mention exciting!) for me to buy my own car. For the past few weeks, I have been scanning craigslist for listings for cars that are in good shape and cost less than $1,000. Yesterday I came across a listing for this Toyota Camry and knew that I had to see it. I saw it that day and bought it later that night for only $650 with my own money. The car is a four door sedan, a Toyota Camry manufactured in 1991. It has about 174,000 miles on it and still runs well. Even though this car is older than me (! ), I really like it. I love the maroon color, the shape and the vintage feel to it. Today, I wore a relatively simple outfit consisting of a striped top and high waisted denim shorts accompanied by a tan bag and flatforms for a day spent cleaning my car and registering it at the DMV. It cost $85.75 to register the car and purchase the license plate. It could have been more expensive but I decided to go with plain (not personalized) license plates and save about $25. After registering the car and attaching the new license plates, my dad took me out and bought me my first tank of gas. While at the gas station, we also cleaned my car up a little bit with one of those car vacuums you can use for about $1 for every five minutes. I plan on washing the outside of my car tomorrow but for now, this is great! After that, all I have to do is add my cute little RVA bumper sticker and the car will be ready to go! Hello! 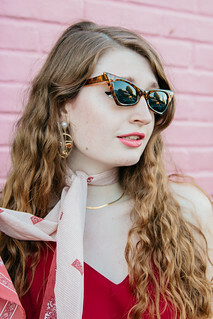 Yesterday, I styled my pink-tinted, heart shape sunglasses with a pink, backless dress, Urban Outfitters backpack and my lace- up boots for a chic look perfect for a calm day. Thanks for all of your comments! I have some exciting news to share with you guys so keep an eye out for another post either later today or tomorrow. Hello! Today, I wore my brand new lace dress from Oasap. I absolutely love it; the color is so versatile and the lace is just dreamy! I paired it with my vintage Ralph Lauren denim jacket to add a little bit of American flair, oxfords, tights that I cut into socks, my preppiest belt and one of my favorite bags- a vintage camera case. I thrifted most of this look- the denim jacket, the camera case and my latest thrifting find- a preppy, equestrian-style belt. 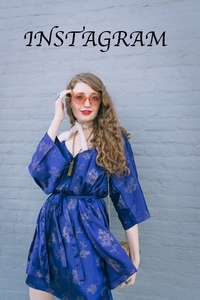 I thrifted it in Simsbury, Connecticut- a great place for preppy finds! While I was staying with my grandparents, we visited many thrift shops and there were preppy belts and plaid skirts in abundance. As you can see, my little doggie, Bella, joined in for a few photos. Thanks for all of your comments! Hello! As you all know, the school year is quickly approaching. For my post today, I collaborated with a few of my favorite high-school fashion bloggers to give you a few tips and tricks on picking out your first day of school outfit. Enjoy! Why you would wear this on the first day of school: I don't know that is this only in Hungary but students mostly have to wear black and white on every school ceremonies like the school beginning or the school ending and so on. So that's why I would wear that outfit if we wouldn't have a school uniform for the ceremonies. I think it's casual and perfect for the weather as well. Any tips for picking out a first day of school look? I think you should wear something comfortable but a little bit casual at the same time because you know the first day of school is only once in a year so it should be a bit different from your other outfits. Why you would wear this outfit on the first day back to school: I would wear this outfit because it's cute,fashionable and really comfortable! I also like to make a statement on the first day back and I think red suspenders would do just that! Hey Fashion Trends & More readers! I'm Rory from the blog Wear Abouts. I'm 16 (going on 17) and I'll be a junior in September. Choosing my first day outfit has always been a ritual. I try endless pairings of tops, skirts, dresses, jackets, shoes, etc until I find the absolute perfect outfit. Some people may say, why dress up on the first day? Why even bother? Well, think of it this way. You haven't seen most of these people in a few months. It's like meeting someone all over again--and you have to make a good impression! Here are my go-to tips for a comfortable, chic, and unforgettable back to school outfit! Tips: Don't be afraid to stand out! There's no better day than the first day to experiment with a completely new style! I wouldn't suggest wearing heels your first day if you haven't worn them to school before. I'd recommend wearing a maxi dress if you need ideas though! They are comfortable, easy to style, and look rather elegant without forcing it! :) Also, lipstick isn't as commonly worn by highschoolers, but you don't even have to wear deep violet or super red lipstick, you can also opt for a light pink or fuchsia lipstick! I always like to have some type of headpiece on, whether it be a beanie, fedora, turband, hippie headband, etc, it really tops of your look. Hope that you all enjoyed this article! Anyone else already have their first day looks planned? Hello! I have a special post for you today- an interview with an innovative, new website, Mallzee. When Mallzee contacted me regarding their site venture, I was very interested. I learned a little more about the company and now I can't wait for the site to go live! I was able to interview one of the brains behind Mallzee, Cally, to learn a little bit more about the site. Read the interview below. First, can you explain a little bit about the concept behind Mallzee? Mallzee is all about making shopping social again. We all love shopping at the mall but most of us just shop online now. Why can't we get that Mall fun, chat and help whilst we shop online? That's the concept behind Mallzee! How did you come up with the idea for Mallzee? Our team has been looking at social shopping for a while and it's a space that really excites us and is somewhere we think we can make something really special and change the way people do something. When Mallzee launches later this year we really hope it's going to change the way people shop online - forever! PS. A lot of scratching of heads, eating chocolate and late nights came up with the name Mallzee! Mallzee works by finding products matched to your tastes from across the internet. We then let you only show products suited to you from your favourite stores/brands in your online mall - or Mallzee! Then using Facebook/Twitter you can chat to your friends about the products on show and have them pick out stuff from different shops. If you're not online your friends can still visit your Mallzee and buy for themselves, or buy you a wee present. Thanks to our relationship with companies we then charge them a commission once you click through and buy something from them. We then give this to the owner of the Mallzee which then can then withdraw or give it to charity. What are some of the more well-known brands that you are working with? Are you working with Steve Madden or every blogger's favorite, Jeffrey Campbell? We would love to tell you the big old list of 200+ companies we have signed up but we can't do that just yet. But seriously - watch this space! Anything else about Mallzee that you would like to share? It's ace, it's fantastic - sign up now at www.mallzee.com as we are only allowing a certain number of people to have first access and the spots are going fast! Plus, if you do then we will enter you into a couple of comps. Thanks, Cally! Now, if I were you I would go sign up for a Mallzee account! I already have and like I said earlier, can't wait to see what the site will be like when it is up and running. Note, I posted about this topic because I thought Mallzee sounded like something that you all would be interested in. Mallzee did not compensate me for writing this article although I may guest blog for them later on. I hope you all enjoyed this post! Hello! Today, I played around with my look by combining two denim pieces for an urban, minimalistic summertime look. Simple converse and fun bicycle sunglasses were added to complete this casual look.